It’s a new era of die design and development at world-renowned Autodie, Grand Rapids, MI, where new ownership is consistently investing in new technology and training. The goal: To advance the company’s future as a leading, global supplier of stamping-die engineering and manufacturing services. 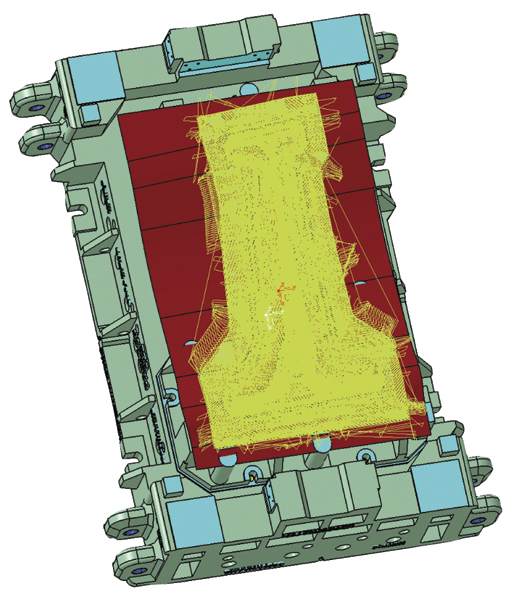 This screen shot from Autodie displays the firm’s manufacturable design for a bodyside die, as well as the tool-path sequence. 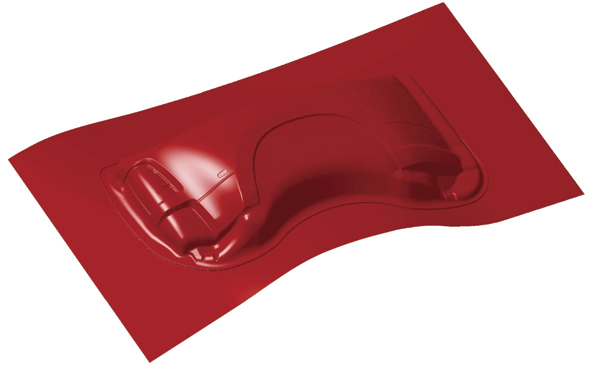 Slated to close its doors in 2006, after having enjoyed 40 years of success specializing in large dies for the automotive industry, for body sides and Class A surfaces primarily, Autodie has been reenergized and resurrected. While the firm’s success once rode on the back of a single customer, Chrysler, it now works for several automotive OEMs and has nearly doubled its annual revenue since 2007. Technology was, unfortunately, not als a focus at Autodie, Darling admits. In the late 1990s and early part of the new century, management treated technology as a commodity, as opposed to a core part of its business. As did numerous others in the North American automotive-industry supply chain, Autodie also outsourced die making to low-cost countries. “We followed that line of thinking until 2006,” Darling says. Beginning in 2006, Darling and his engineering team focused on rebuilding the technology literacy within its walls, becoming devoted to controlling the die design and build process from start to finish. By January 2007 it was ready to launch its newly developed process, which begins inhouse with development and simulation. Die faces are delivered to a select group of die-design firms charged with creating designs ready to go directly to NC programming. “We’re zealots in terms of die development and simulation,” says Autodie COO David Darling. “We are absolutely committed to providing our die-manufacturing group with 100-percent NC-ready die designs,” as evidenced by this fully surfaced Class A development. In the beginning of the Autodie transformation, its die-design standards manual comprised just a few pages. Today it’s swelled with content to include more than 165 pages of instructions and examples to teach the design community a new of doing things, to enable machinable solids and avoid any remachining due to collisions and interferences. Asked to provide examples of this “added content,” Darling points to Autodie’s proprietary application of exercises such as trim-post expansion, press compensation and radius reduction. “Not only have we eliminated that additional four to six weeks of surfacing we used to perform in order to prepare a die design for NC programming, but we also made time to perform these extra exercises,” he says. 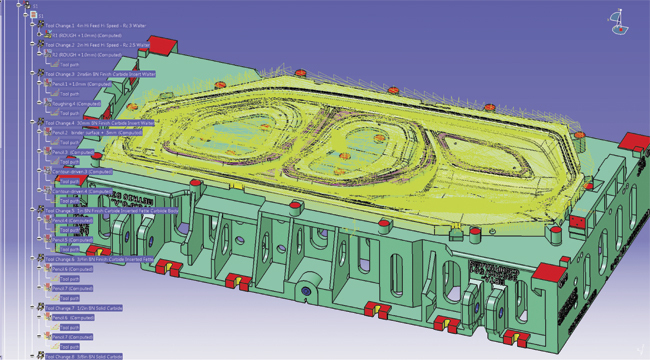 Other lean die-development efforts shine at Autodie. For example, Darling describes the firm’s use of starter blocks that contain features and identifiers to provide designers a good starting point and help ensure that they will develop dies that meet internal standards. Another example of the scope of the dies developed at Autodie: a fully tool pathed draw die. The firm’s lean-development efforts have taken a staggering number of hours out of the process, critical when you’re talking about a shop that averages 500,000 labor hours per year. The journey to lean, efficient die development and assembly has been challenging yet extremely rewarding, Darling summarizes. “And it’s come thanks to a team of engineers and shop employees committed to working through some intensive struggles,” he says. “Not to mention the commitment of our suppliers to accept our standards and immerse their employees in our training.” It also has led to a machining-technology evolution the company could never have envisioned just 5 short years ago, when its inventory of CNC equipment largely was comprised of machines installed in the mid-1980s. Now the company is comfortable knowing that upgrading its CNC equipment, in concert with improving the accuracy and reliability of its development process, will fuel its continued growth in terms of its customer base, capacity, and revenues and profitability. “Early in 2011 we announced a 2-yr. capital plan to invest $24 million in new CNC equipment,” shares Darling, “and we’re well on our to making that happen. Among our new additions are three 3.5- by 6-m bridge mills equipped with 20,000-RPM heads and that cut at 15 m/min., and two mid-sized horizontal machining centers also rated to cut at 15 m/min., with spindle speeds of 20,000 RPM.